Serve this old-fashioned soup with a thick slices of buttered country-style bread. Alight and delicious soup that’s good for you too. 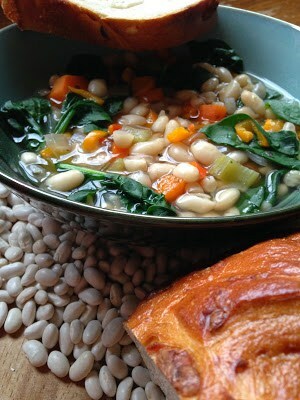 White Bean Spinach Soup is great to serve anytime. Made with dried, soaked great northern beans, low sodium chicken broth, (substitute vegetable stock for a meatless option) fresh baby spinach, orange sweet peppers, celery, carrots and onions this soup is a fantastic dinner option if you’re watching calories. In a large soup pot, combine the soaked beans with 8 cups water. Bring to a boil, lower the heat and simmer covered for 2 to 2 1/2 hours or until beans are tender. Do Not Drain Water. Add to the cooked beans; chicken broth, 2 cups spinach leaves, sweet peppers, carrots, onion, garlic, celery, bay leaves, oregano, sage, salt and pepper. Simmer until veggies are tender. Discard bay leaves. Using a fork, slightly mash some of the the beans against side of pan. 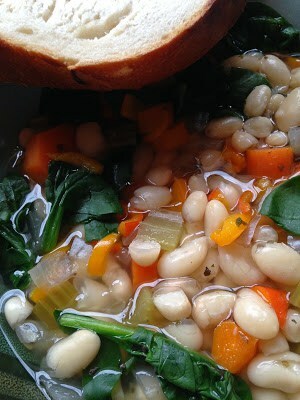 Before serving, divide remaining 1/2 cup baby spinach leaves between soup bowls. Ladle hot soup into bowls. In a large saucepan, combine beans and 6 cups water. Lower the heat and simmer, uncovered, for 2 minutes. Remove from heat. Cover and let stand for 1 hour. Combine beans and 6 cups water in a large glass bowl. Drain and thoroughly rinse beans. *For this recipe we used pre-washed, packaged baby spinach leaves. Try these two sensational recipes: Pork Chops with Mushroom Risotto and Grilled Peppers and Portobello Mushrooms. Did You Know? Do some taste-testing of various brands of Dijon mustard. Not only do they vary in color, from bright yellow to brownish yellow, but their flavor vary as well. 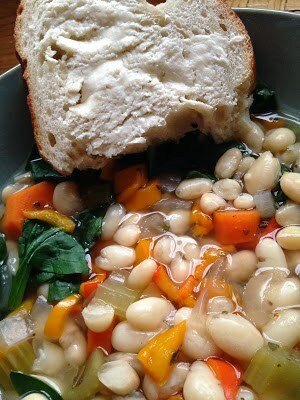 What a great simple healthy soup… yes, and I love the buttered bread too. Bring it by foodie friday today. Oh this looks so warm and hearty and delish and pls pass a bowl!! Do you think after the soak you could cook it in the crock pot? Well doesn't matter because it looks so good I can just cook it on the stove! !